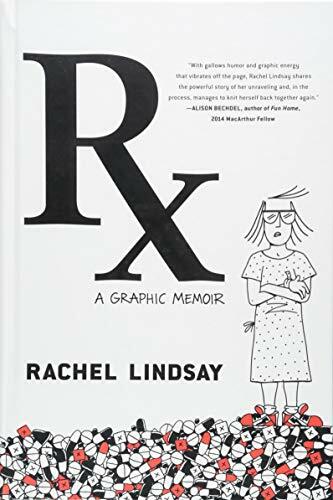 RX is primarily an account of Rachel Lindsay's working in corporate marketing for Big Pharma, getting sick of it, being diagnosed with a manic episode, and being hospitalized. It is a graphic work drawn in bold black and white panels. The style is on the crude side, but there's also something careful and controlled about it, with an economy that is pleasing. She conveys her emotions and thoughts powerfully with her art. She worked in New York City on the advertising industry on Madison Avenue, living in the East Village in 2010, having graduated from college not long before. She had been diagnosed as bipolar and was taking meds and seeing a psychiatrist on a regular basis. The most gripping part of the story is when she is moved to working on the direct-to-consumer marketing of a new antidepressant. The tension between taking medication that is meant to be healing and working on a project that treats medication like soap powder, manipulating people with mental illness to "ask their doctor" about it gets to Lindsay. She reacts badly and becomes emotional. When she decides to quit her job her parents intervene and get her put in a psychiatric ward, on the grounds that she is having a manic episode. Lindsay herself never seems particularly convinced that this was really a manic episode, while at the same time she acknowledges that she has bipolar disorder and keeps on with her treatment. So the story raises the question of when can a person diagnosed as bipolar ever make major life changes that go against what other people believe is wise without risking being treated as being irrational and in need of correction. Since Lindsay identifies as an artist and does not want to go along with the conventional choices of society, it seems like she is constantly at risk of being seen as being controlled by her illness rather than making her own choices. This makes RX a striking depiction of the problems of living as a person diagnosed with bipolar.